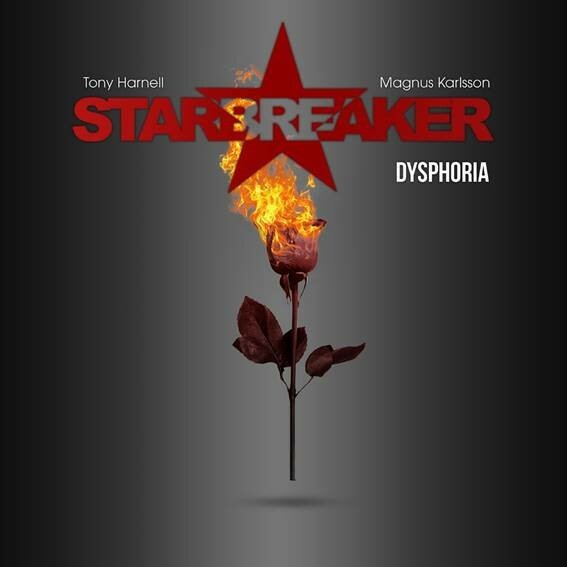 Tony Harnell, the critically acclaimed singer/songwriter and former vocalist of multi-platinum hard rock band TNT, and Magnus Karlsson, current PRIMAL FEAR guitarist extraordinaire, have rejoined forces for the release of the third STARBREAKER album! Entitled “Dysphoria,” this new album showcases everything the project has become known for: metal sensibilities, melodic songs with killer hooks, thought-provoking lyrics, inventive, intricate guitar playing, occasional prog twists, and crisp production. Along with explosive performances from Harnell and Karlsson, these are the trademarks which the listener will find in “Dysphoria,” and that makes this album so unique and special. STARBREAKER started as Harnell’s side project while he was still fronting TNT. He was initially working on a solo record, with Karlsson, former TNT drummer John Macaluso, and bassist Fabrizio Grossi, but they morphed into STARBREAKER, releasing their first self-titled studio album in 2005. In late 2007, Harnell flew to Sweden to write the bulk of the songs for the new album with Karlsson and started recording the new songs at the end of that year. The group’s second album, “Love’s Dying Wish” was released in August 2008. It featured new bassist Jonni Lightfoot, who replaced Grossi, and was produced by Harnell and Karlsson, with Tommy Hansen (TNT, PRETTY MAIDS, HELLOWEEN) serving as the mixer.